German-American physician and writer who is known for his many epigrams about the practice of medicine. In Charlie Walker, My Few Wise Words of Wisdom (200), 151. A doctor whose breath smells has no right to medical opinion. Bacteria keeps us from heaven and puts us there. 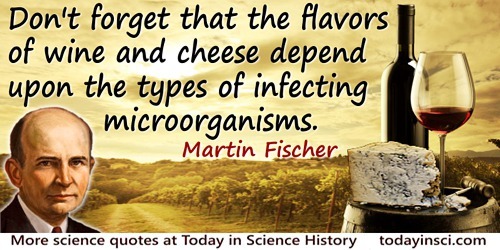 Don’t forget that the flavors of wine and cheese depend upon the types of infecting microorganisms. Every discovery in science is a tacit criticism of things as they are. That is why the wise man is invariably called a fool. Expect an early death - it will keep you busier. God’s interest in the human race is nowhere better evinced than in obstetrics. If you are physically sick, you can elicit the interest of a battery of physicians; but if you are mentally sick, you are lucky if the janitor comes around. In diagnosis, think of the easy first. It is unsafe to talk mathematics. Folks don’t understand. Martin H. Fischer, Howard Fabing (ed.) and Ray Marr (ed. ), Fischerisms (1944), 3. It takes fifty years from the discovery of a principle in medicine to its adoption in practice. Life goes faster on protein. Man embraces in his makeup all the natural orders; he’s a squid, a mollusk, a sucker and a buzzard; sometimes he’s a cerebrate. Observation, Reason, Human Understanding, Courage; these make the physician. Only one rule in medical ethics need concern you - that action on your part which best conserves the interests of your patient. Psychology is physiology above the collar button. Sin is commitable in thought, word or deed; so is virtue. Surgery is the cry of defeat in medicine. The first rule to proper diet? Ask them what they want and then give it to them. There are few exceptions. The greatest discoveries of surgery are anaesthesia, asepsis, and roentgenology—and none was made by a surgeon. The heart is the only organ that takes no rest. The natural philosophers are mostly gone. We modern scientists are adding too many decimals. The only equipment lack in the modern hospital? Somebody to meet you at the entrance with a handshake! The patient does not care about your science; what he wants to know is, can you cure him? The practice of medicine is a thinker’s art, the practice of surgery a plumber’s. Martin H. Fischer, Howard Fabing (ed.) and Ray Marr (ed. ), Fischerisms (1944), 4. Your mind works very simply: you are either trying to find out what are God’s laws in order to follow them; or you are trying to outsmart Him. You’re no good unless you are a good assistant; and if you are, you’re too good to be an assistant.